Today ASRock has announced two brand new motherboards based on AMD's B450 chipset. Notably, both the ASRock B450 and B450M Steel Legend feature the company's "Full Spike" ESD protection for the boards' USB, Ethernet and audio ports, and utilize 60 A power chokes and Nichicon 12 K black capacitors for voltage regulation. 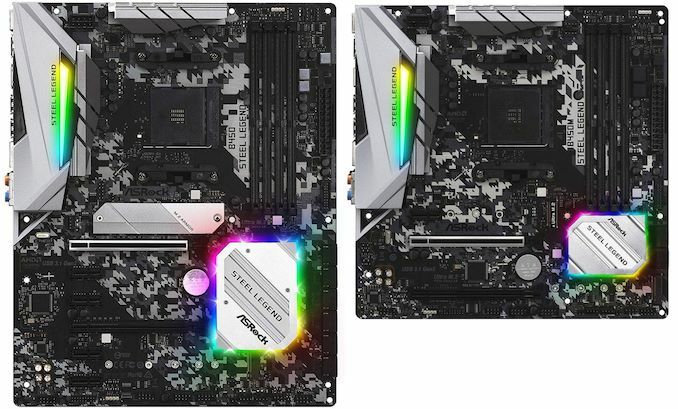 Essentially the same motherboard available in two differnt form factors, the ASRock B450 and B450M Steel Legend motherboards use silver XXL aluminium heatsinks on both the power delivery and chipset. As an added kicker, the chipset heatsink and rear panel cover both include integrated RGB LEDs as well. 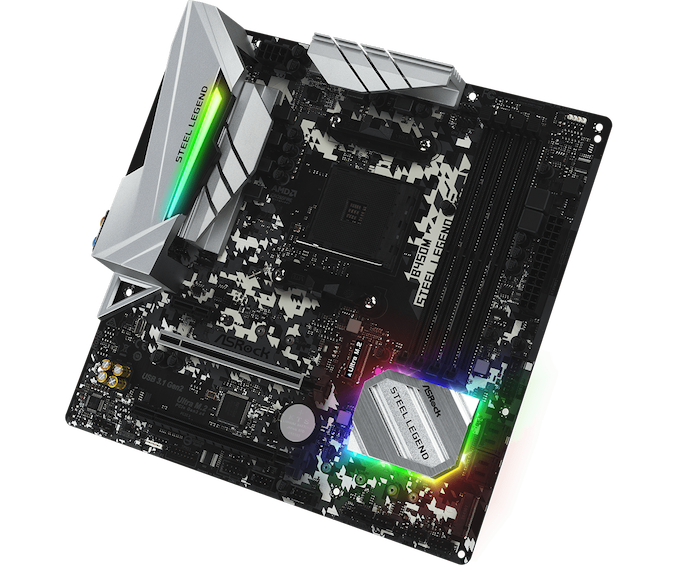 ASRock has gone with what resembles a digital camouflage patterning which covers the majority of the PCB to make the Steel Legend boards stand out from the crowd. Some of the Steel Legends' core features include full lightning/ESD protection across the USB, Ethernet and audio ports. For stability when overclocking, both the B450 and B450M Steel Legend make use of 60 A power chokes and 12 K Black capacitors for voltage regulation. Both boards include a single 8-pin 12 V CPU power connector and are advertised as having a 6-phase power delivery system. Other benefits include AMD StoreMI support, which is native to the B450 chipset, and PCIe Steel Slot protection on the top full-length slot on both the ATX and microATX Steel Legends. A total of four memory slots with support for dual-channel DDR4-3533 and capacity of up to 64 GB is also present. As for integrated components, the ASRock B450 and B450M Steel Legends share the same controllers including a Realtek ALC892 audio codec, Realtek RTL8111H NIC, and two PCIe 3.0 M.2 slots (one x4 and the other x2). Both models also include four SATA ports with support for RAID 0, 1 and 10 arrays. Cooling connectivity is catered for with five 4-pin fan headers on both boards. In fact the only differences between the two boards is their size and the resulting number of PCIe slots available; the mATX board otherwise includes everything found on the full ATX version. To that end, the B450 and B450M Steel Legends both feature two full-length PCIe 3.0 slots (x16 and x8/x4) and a single PCIe 3.0 x1 slot, while the ATX sized model adds three more PCIe 3.0 x1 slots. On the rear panel, both motherboards share the same layout with one USB 3.1 Gen2 Type-A port, one USB 3.1 Gen2 Type-C port, four USB 3.1 Gen1 Type-A ports, and two USB 2.0 ports. A single Ethernet port, five 3.5 mm audio jacks and S/PDIF optical output are taken care of by a budget-friendly Realtek pairing (RTL8111H and ALC892). Two video outputs consisting of an HDMI and DisplayPort 1.2, with a PS/2 combo keyboard and mouse port rounding off the connectors. Users can expand on the rear panel USB with two USB 2.0 headers and a single USB 3.1 header which are available on both models. 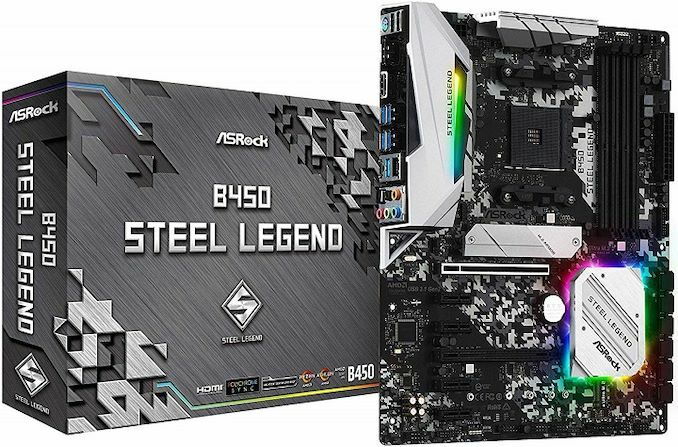 As it stands there's no information on the availability or the pricing of the B450 Steel Legend motherboards, but they are expected to filter into retail channels soon. call it "legend" but use a run of the mill audio solution 892 CODEC, instead of say an 1150 or 1220, doing so would add to the cost ~0.35 so maybe $2 to end user. the rest of the board looks nice seems "quite" high end considering the various additions, but sadly that audio or lack thereof is what the hell because these seem to be "no compromise" or they would appear as such, lack of a higher codec IMO for my wallet means no more than $200 CAD or they enter a why bother when others out there do..shame really because the component selection etc otherwise is awesome. $200 CAD would be too high. There are $150 CAD ITX b450 boards with AC1150 audio and an Intel NIC including Asrock's own ITX board. There are also $150 ATX boards with the same. So happy to see a board with display outputs that doesn't include DVI. Would've been happier if they'd made better use of the space to stack the HDMI and DP and add another two USB 2.0 ports on the rear. "In fact the only differences between the two boards is their size and the resulting number of PCIe slots available; the mATX board otherwise includes everything found on the full ATX version."